Using solar panels is one of the best alternative means of getting energy that we need on a daily basis. Electricity is something that we can hardly live without. It powers our watches, our computers, our homes and offices, and virtually everything else. However, conventional electricity supplied to our homes comes at a steep price. Our monthly energy consumption bills are testimony to the fact that a large part of our savings goes towards paying these bills in order to ensure the uninterrupted supply of electricity. What if you had an alternative source of electricity? What if you could ‘manufacture’ electricity right in your backyard (or on your rooftop!)? By installing solar panels, you indeed can! Solar panels receive and trap the sun’s rays and convert them into various useful forms of energy. Electricity is one such form of energy. The high-efficiency solar cells that are available commercially at various stores are made from industrially processed silicon. In fact, purified silicon is one of the core ingredients of making solar cells and solar panels. Manufacturing purified silicon is an elaborate process requiring professional equipment, high temperatures and a good deal of expertise. All this is clearly beyond the reach of the common man. However, if one were to ask me about how to build solar panels at home, I’d say that it is quite possible. Homemade solar cells may not pack in as much punch as their industrially manufactured counterparts. However, these residential solar panels can still be used to generate modicum amounts of electricity that can power a range of applications in a common household. Or if you want, you can also make commercial solar panels to power the workplace. There are simply too many alternative energy incentives for you to ignore solar power. Before going into building solar panels, you need to know how to make solar cells at home. The common material of choice while making solar cells at home is not silicon, but cuprous oxide. In fact, cuprous oxide is one of the first materials that were discovered to display the photoelectric effect wherein light causes electricity to flow in a material. Cuprous oxide belongs to the family of substances called semiconductors. In every semiconductor, a gap (often referred to as a bandgap) exists between the electrons that are bound tightly to the atom, and those that are located farther from the atom, which can move freely and conduct electricity. When sunlight excites the electrons in cuprous oxide, some of them gain enough energy from the sunlight to jump past the bandgap and become free to conduct electricity. If you’ve never built a solar panel before, or are just starting out on the fascinating subject of solar energy harvesting, you are well advised to keep with you a good guidebook. A step-by-step manual will not only help you get started on the right path by helping you find the best place in your home or the workplace, but will also show you how to save money by showing you where to buy cheap parts from. The guidebook will also help you install such a system and complete the wiring. And you will also need to know about the safety instructions. 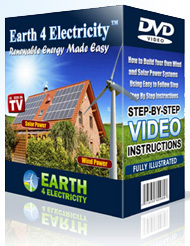 Such a guidebook offers a great way of ensuring your success with solar panels.